The probiotic family just keeps on growing! After having taken their place on store shelves, sauerkraut and other lacto-fermented products are now making their way into the trendiest restaurant kitchens. It's much easier than you think to make your own fermented products at home, with no specialized equipment. And who better to guide us in this discovery than David Côté and Sébastien Bureau, the fermentation guru? 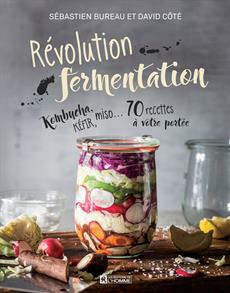 This book, intended as an easy and entertaining introduction, suggests roughly forty fermented products to make at home. Divided into four categories (based on fruits, sugar or honey; based on vegetables; based on cereal grains or legumes; based on vegetable or animal milks), the fermentation recipes are clearly presented. Lastly, roughly thirty recipes offer suggestions on original ways to integrate our fermentations into an ultra-healthy meal! All of the recipes are vegan and some have a lacto-vegetarian variation. So there's no longer any excuse: discover these unique and delicious products, and boost your diet along with your health! A book that is modern in design, entertaining, and not at all intimidating! The authors' credibility is beyond reproach.